Long time no fan art! Real life interfered, like it does, but rest assured I hope to once again showcase the finest and weirdest in obscure fan art for you lovely readers. 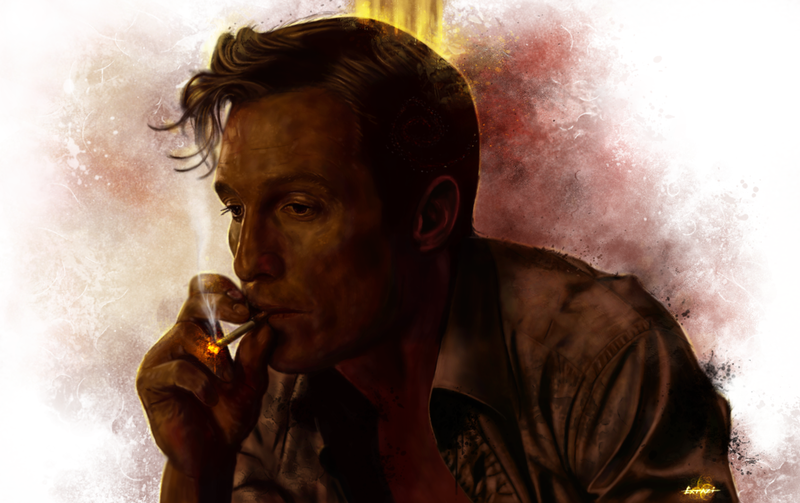 For my grand return I bring you my pick of the best fan art of Matthew McConaughey’s creepy True Detective, Rust Cohle. There is a huge amount of fan art for this guy and some of an incredibly high standard. Just like the show did for viewers, the character has clearly captured the imaginations of many talented artists. I have honestly found it so hard to choose just five images to show you that strongly recommend you all have a search and see what is out there. First up is this image from Andrey Pankov. It’s taken from a screencap and seems to be a popular image to start from, but I love the mood in this. There’s some real skill and talented didgital painting, but also it isn’t just a cold rendering of a screencap, there’s emotion in this image. Next up, this gloomy piece from Saad Irfan. I love the texture in this image, it goes beyind the smooth realism of a lot of digital painting, and includes some of the sinister, supernatural elements of the show. 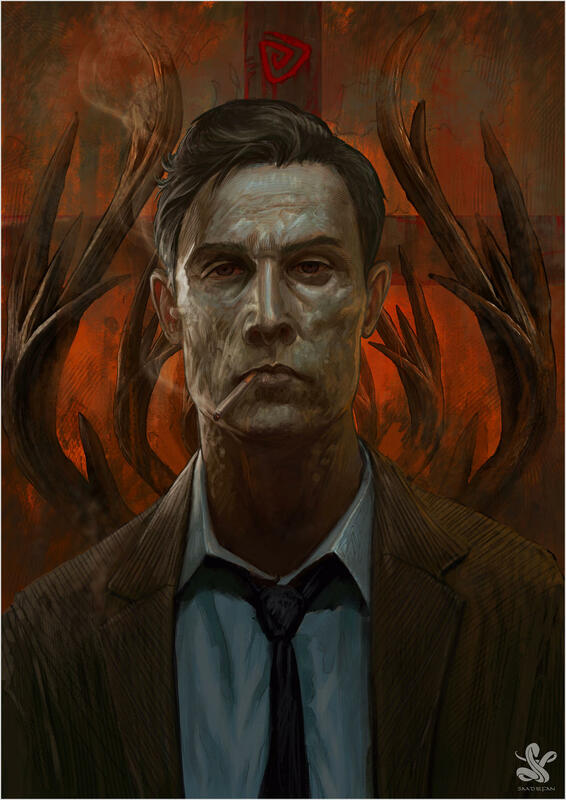 This is a man who is haunted, almost inhuman – a great way to see Cohle. Next, this image from Tara Phillips. You might notice this is likely taken from the same image as my first pic, but I liked it so much I had to include it. From my previous comments you might think I don’t like realism, but just look at the lighting and skin-tones on this! A beautiful portrait, a little detached and cold, but a brilliant likeness of the character. A little treat for you now, and something a bit different, this image from Riccardo Minervino absolutely blew me away, not because of the great choice of pose, the realism or the movement in the image, but because this is in fact an insanely detailed and well put together 3D rendering. I love to see fan art in different media, and 3D modelling always impresses me. Job well done! You should all go and check out the other pics, showing the uncoloured components and the construction of the piece. Finally, this image from Reddit user SomeWeirdSin. 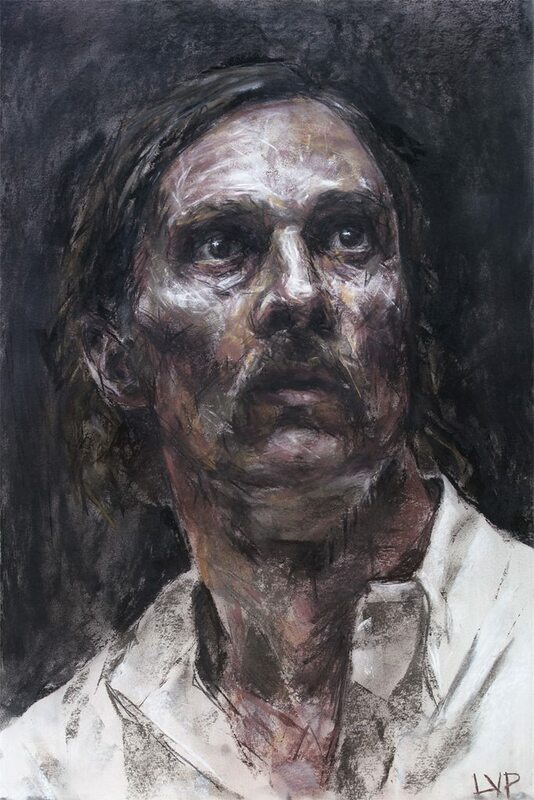 Here we see Cohle in Carcosa, witnesed whatever horror he saw at the final showdown. 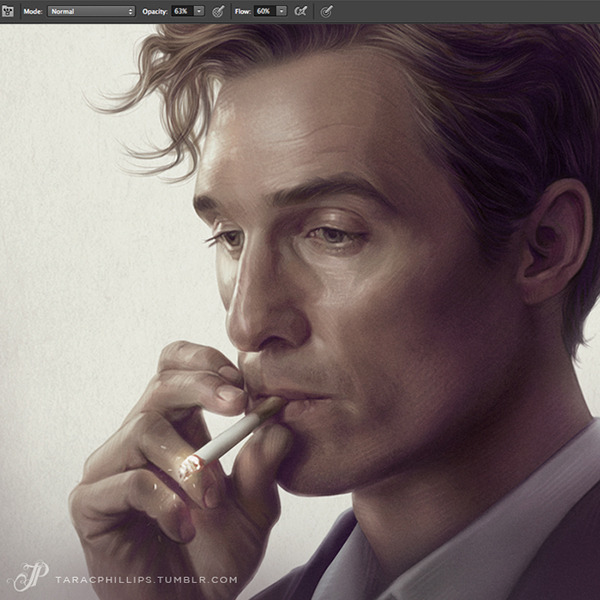 The artist has also done an amazing image of the young Cohle. For starters, I’m always impressed by hand drawn art and the skill here is incredible, masterful use of the media, and the right choice for the image in my opinion. The expression of horror on his face truly sums up the series, and is a great insight into the character, while also giving the feel of an old master or impressionist painting; the artist says he was inspired for the face by a painting by Ilya Repin, a Russian realist painter from the early 20th Century. I love this image, there is real passion and insight behind it, this is fan art done for the love of the show and the character, everything good fan art should be. I’d like to thank all the artists I’ve featured in this piece (and previous fan art features), keep doing what you’re doing, you amaze me with your talent, skill and passion for your fandom. This is what geekery should look like!